Sleep is such a wonderful thing, it wasn't until I stopped getting it that I realized just how wonderful it was. In June I began to suffer sleep insomnia, after several rounds of blood tests my doctor can't find something wrong with me. I am lucky to get 2 hours of sleep a night. I started to look online to find ways to help me relax and Lavender happened to show up on so many of the search results! 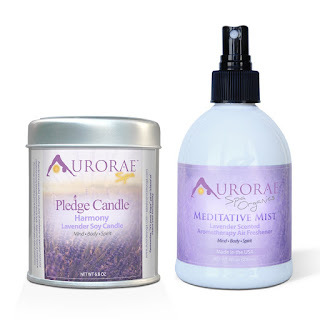 When I seen Aurorae offered a Lavender Organic Spa Gift package I knew I had to check it out! It has both a candle and a mist to really help spread the lavender through out a room. You can spray this on your bed, couch and even a yoga mat if that is your thing. The Lavender scent really helps to create a calm setting. I wont lie I still don't sleep good, but at now I am a bit calmer :). Plus my bed sheets smell pretty awesome! What I have noticed is it helps calm me down during my stretches. My doctor suggest I do some easy night time stretches, nothing major. I spray my yoga mat with the Lavender mist as I taking my deep breath during stretches I have this wonderful lavender aroma that really helps to center me. The Candle so far is long lasting and really gives off a great scent that makes the entire room smell good.